Christopher Kimball and the cast of AMERICA'S TEST KITCHEN, the most-watched cooking show on public television and a 2012 Daytime Emmy nominee, use a common-sense, practical approach to solve everyday cooking problems and save viewers time and money. 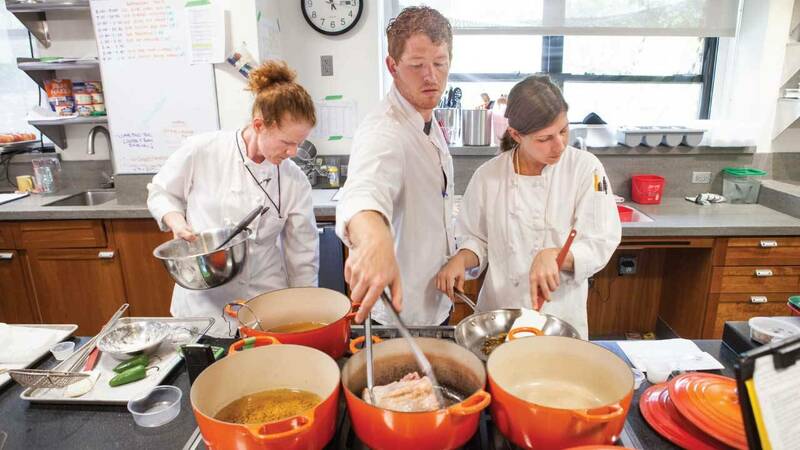 Kimball and dedicated test kitchen cooks Bridget Lancaster, Julia Collin Davison and Rebecca Hays reveal the basics of foolproof home cooking while preparing dozens of exhaustively tested recipes. Adam Ried, the test kitchen's resident equipment expert, takes Kimball through the unbiased results for mixing bowls, ladles, mandolines, French presses and other kitchen items. "Gadget Guru" Lisa McManus reviews iPad holders, red wine stain removers, microwave pasta cookers, knives and more, and reveals which ones justify the cost. Test cook Dan Souza shows host Christopher Kimball how to make a simple pot-au-feu at home. Next, Chris answers cooking questions in Letters to the Editor. Then, test cook Bridget Lancaster uncovers the secrets to the perfect raspberry charlotte. #1602 "New York Natives"
Test cook Julia Collin Davison uncovers the secrets to foolproof New York cheesecake. Then, man on the street Doc Willoughby learns about bagels from Philip Romanzi of Bagel Hole in Brooklyn. And finally, test cook Bridget Lancaster shows host Christopher Kimball how to make the ultimate New York agels. Test cook Dan Souza shows host Christopher Kimball how to make the best roasted rack of lamb at home. Next, test cook Julia Collin Davison reveals the test kitchen’s secret to roasted brined Turkey. Then, tasting expert Jack Bishop challenges Chris to a tasting of dijon mustard. Finally, test cook Bridget Lancaster uncovers the secrets to the ultimate root vegetable gratin. Test cook Julia Collin Davison reveals the secrets to making the best Spanish braised chicken with sherry and saffron. Then, tasting expert Jack Bishop chal­enges host Christopher Kimball to a tasting of Israeli couscous. Finally, test cook Bridget Lancaster shows Chris how to make simple Israeli couscous at home. Test cook Julia Collin Davison shows host Christopher Kimball how to make the ultimate sausage meatballs and spaghetti. Then, equipment expert Adam Ried reviews insulated shopping totes in the Equipment Corner. Next, Chris answers cooking questions in Letters to the Editor. Finally, test cook Bridget Lancaster uncovers the secrets to making tagliatelle with prosciutto and peas at home. Test cook Bridget Lancaster shows host Christopher Kimball how to make the perfect chocolate-caramel layer cake. Then, equipment expert Adam Ried reviews ice cream scoops in the Equipment Corner. Finally, gadget guru Lisa McManus uncovers the best large ice cream makers and thermometers. Test cook Bridget Lancaster reveals the secrets to making the best coq au riesling at home. Next, gadget guru Lisa McManus uncovers the best waiter’s corkscrews. Finally, test cook Julia Collin Davison shows host Christopher Kimball how to make the ultimate Tuscan-style beef stew. Test cook Bryan Roof shows host Christopher Kimball how to make the best quick sauces for sautéed chicken. Then, equipment expert Adam Ried reviews serrated paring knives in the Equipment Corner. Next, gadget guru Lisa McManus reviews her favorite kitchen gadgets. Then, Chris answers cooking questions in Letters to the Editor and shares a quick tip about the best way to cook bacon. Finally, test cook Julia Collin Davison uncovers the secrets to the ultimate roasted mushrooms with parmesan and pine nuts. Man on the street Doc Willoughby visits Joanne Chang at Myers + Chang to learn about shell-on shrimp. Then, test cook Becky Hays shows host Christopher Kimball how to make the best crispy salt and pepper shrimp at home. Next, tasting expert Jack Bishop challenges Chris to a tasting of Sichuan peppercorns. Finally, test cook Julia Collin Davison reveals the secrets to making Vietnamese-style caramel chicken with broccoli. Host Christopher Kimball goes into the test kitchen with test cook Bridget Lancaster to learn how to make the ultimate fennel-coriander top sirloin roast. Next, equipment expert Adam Ried reviews carving boards in the Equipment Corner. Finally, test cook Julia Collin Davison uncovers the secrets to making the crispiest duck fat–roasted potatoes. Test cook Bridget Lancaster reveals the secrets to making the best milk-braised pork loin. Then, tasting expert Jack Bishop challenges host Christopher Kimball to a tasting of apricot preserves. Next, gadget guru Lisa McManus uncovers the best apple corers. Finally, test cook Julia Collin Davison shows Chris how to make the ultimate roasted pears with dried apricots and pistachios. Test cook Julia Collin Davison shows host Christopher Kimball how to make the ultimate slow-roasted chicken parts with shallot-garlic pan sauce. Then, equipment expert Adam Ried reviews carbon-steel chef’s knives. Finally, test cook Bridget Lancaster uncovers the secrets to the perfect boiled potatoes with black olive tapenade. Man on the street Doc Willoughby learns all about Sicilian-style pizza from the Barbati family of L&B Spumoni Gardens in Brooklyn. Then, host Christopher Kimball goes into the test kitchen with test cook Bridget Lancaster to learn how to make the ultimate thick-crust Sicilian-style pizza at home. Next, test cook Becky Hays uncovers the secrets to homemade ricotta cheese. Finally, test cook Julia Collin Davison shows Chris how to make the best pasta with cauliflower, bacon, and bread crumbs. Test cook Julia Collin Davison shows host Christopher Kimball how to make the best Japanese-style stir- fried noodles with beef at home. Then, equipment expert Adam Ried reviews knife sharpeners in the Equipment Corner. Next, Chris answers cooking questions in Letters to the Editor. Finally, test cook Bridget Lancaster reinvents a classic, fried brown rice with pork and shrimp. Test cook Julia Collin Davison uncovers the secrets to making semolina gnocchi at home. Then, tasting expert Jack Bishop challenges host Christopher Kimball to a tasting of balsamic vinegar. Finally, test cook Bridget Lancaster shows Chris how to make the best Italian sausage with grapes and balsamic vinegar. Host Christopher Kimball goes into the test kitchen with test cook Bridget Lancaster to learn how to make the best French-style pork chops with apples and calvados. Next, tasting expert Jack Bishop challenges Chris to a tasting of brie. Then, Chris answers cooking questions in Letters to the Editor. Finally, test cook Julia Collin Davison reveals the secrets to making the ultimate mushroom bisque. Test cook Bridget Lancaster shows host Christopher Kimball how to make the ultimate mu shu pork at home. Then, equipment expert Adam Ried reviews rice cookers in the Equipment Corner. Finally, test cook Julia Collin Davison uncovers the secrets to making the best crispy orange beef. Host Christopher Kimball goes into the test kitchen with test cook Julia Collin Davison to learn how to make the ultimate black bean burgers at home. Next, tasting expert Jack Bishop challenges Chris to a tasting of vegetable broth. Then, test cook Becky Hays shows Chris how to make the freshest super greens soup with lemon-tarragon cream. Finally, test cook Dan Souza reveals the secrets to making homemade vegetable broth. Test cook Julia Collin Davison shows host Christopher Kimball how to make the ultimate braised halibut with leeks and mustard at home. Next, tasting expert Jack Bishop challenges Chris to a tasting of smoked salmon. Then, gadget guru Lisa McManus uncovers the best warming trays. Finally, test cook Bridget Lancaster reveals the secrets to making perfect slow-cooked whole carrots. Man on the street Doc Willoughby learns all about Cuban cuisine at La Carreta in Miami, Florida. Then, host Christopher Kimball goes into the test kitchen with test cook Dan Souza to learn how to make the best Cuban braised shredded beef at home. Next, test cook Becky Hays uncovers the secrets to making fried sweet plantains. Then, testing expert Adam Ried reviews grapefruit knives in the Equipment Corner. Finally, test cook Julia Collin Davison shows Chris how to make the ultimate mango, orange, and jícama salad. Test cook Dan Souza shows host Christopher Kimball how to make the ultimate charcoal-grilled steaks at home. Next, equipment expert Adam Ried reviews steak knives in the Equipment Corner. Then, gadget guru Lisa McManus uncovers the best jar spatulas and jar openers. Finally, test cook Bryan Roof reveals the secrets to making perfect grilled pork kebabs with hoisin and five-spice. Host Christopher Kimball goes into the test kitchen with test cook Julia Collin Davison to learn how to make the best chicken mole poblano at home. Then, tasting expert Jack Bishop challenges Chris to a tasting of Mexican lagers. Finally, test cook Bridget Lancaster reveals the secrets to making the ultimate drunken beans. Test cook Becky Hays shows host Christopher Kimball how to make the perfect peri peri grilled chicken. Then, equipment expert Adam Ried reviews the latest grill gadgets in the Equipment Corner. Next, Chris answers cooking questions in Letters to the Editor. Finally, test cook Bridget Lancaster uncovers the secrets to making the best pita bread salad with tomatoes and cucumber. Test cook Julia Collin Davison reveals the secrets to making the perfect strawberry-rhubarb pie. Then, equipment expert Adam Ried reviews cold brew coffee makers in the Equipment Corner. Next, gadget guru Lisa McManus uncovers the best tea gadgets. Finally, test cook Dan Souza shows host Christopher Kimball how to make the best cherry clafouti.